Published Tuesday January 30th, 2007 from Camarillo, CA. Listening to tracks I bought from TrackItDown to DJ with, feeling mostly lost, and a little insane. I took note of my tunnel vision today. Driving back to work after my lunch break I realised how narrow my perception of my vision seemed to be. For the rest of the day at work I tried to shake it off and somehow escape the feeling that I was deep within a shall staring out into the world through a tiny peep-hole. I was pretty sure I had felt similarly in the past, and a quick search through my blog confirmed. Just a kind of interesting observation with a little rant here, and a horrible visualisation of what I am talking about. I have a similar experience when I'm very busy, or stressed or am rushed. 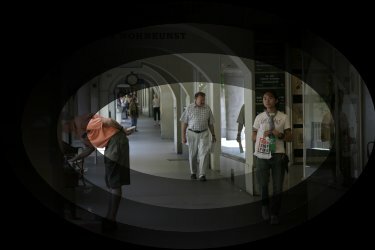 I suppose one could say that my visual comprehension is diminished, either intentionally because I don't want to see the world, or because I'm busy thinking about other things that I can't deal with the rest of what my eye sees and thus, in the end, I get this vignetting effect in my perceived vision." This also showed me that my blog is much more an archive of my life, my thoughts, and my emotions than I had previously realised. Maybe one day I can edit it (my blog) down into something useful and interesting. I also took note of myself doing this thing where I'll think something, and think that I am saying it out loud.. But in actuality I'm just saying it in my mind and am instead in reality just standing there silently. I wont even realize this until the moment has passed and I go back in my thoughts and realise, "No wonder they just blankly stared at me." This seems to happen to me a lot at work. My boss, Lance, will ask me something and I'll just smile at him while thinking that I told him what I had thought in reply to his answer. I would ramble more, and perhaps vastly improve the quality of this entry were it not already past midnight. This will probably be the last entry for January. Oh well..
That opens up entire projects in text-parsing. You could analyze your emotions throughout the months and years and come up with motifs and themes for your life, as well as figure out which seasons make you moody. I suppose you could go further and determine how school, work, and your social life affect your general outlook on life and maybe derrive some forumla for the proper amount of each. Or something. In the very least, you've got some great reading for your great great grandchildren after you and the world we know is less than a faded photo (faded bytes?) in the closet (will they even have closets?). Wow im gonna have to touch base with the tunnel vision or what i would call just "zoning out". Also thinking out entire conversations w/o there being one word muttered; Wondering why people didn't understand what i just said.